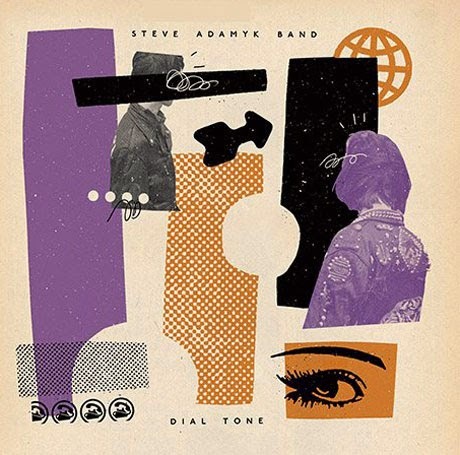 Over the course of three albums, Ottawa's Steve Adamyk Band have flown under the radar. It's a shame because they are making some of the best no-frills garage rock in the country. Now they are back with Dial Tone, album number four, which should help turn some more ears on to what's happening in the nation's capital. There's really nothing fancy to what this trio does. They play fast-paced, catchy music that will get you moving, without any nonsense. The record kicks off with the Buzzcocks-ish "Forced Fed", and doesn't relent for the rest of it's 30 or so minute running time. In fact, the tracks run so seamlessly into one another that you'll often find yourself three songs behind if you try to follow along with the track list. You're head will bop to the garage/punk sounds of songs like "Careless", "You're the Antidote" and "Anne". The clatter of "M.R.I." can't hide the hook buried deep within, nor can the harried guitar work of "Waiting for the Top". The sameness of the songs can be a negative at times. It would be nice to have a bit more diversity in the style, but that might just be nitpicking what's otherwise a solid and enjoyable record. Best tracks: "M.R.I. ", "You're the Antidote"